Dr. Llenos continues to practice family medicine at a clinic in Caldwell, Idaho. He spoke with us recently about how his time as a resident has shaped his career. “I gained a better picture of people with very limited income. You have to be really careful and cognitive on how you can help the patient without putting a lot of burden on them financially,” said Dr Llenos. Dr. Llenos reflected on the times during residency he encountered patients with complex illnesses. 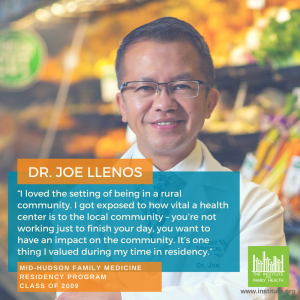 “My training [at the Mid-Hudson Family Medicine Residency] really opened me up to how multidisciplinary care plays a vital role in helping a patient with a complicated illness. We collaborated with providers from mental health and other specialties to ensure the patient received the best possible care,” he said.